Over the past decade or so, the consumer has become more ethically and environmentally aware of what they buy and the way they live. This discernment has spread to the houses we buy and how we live on a day to day basis. We now expect our new houses to be designed to use less energy and more planning to go into the sustainability of our areas. Developers Crest Nicholson and A2 Dominion in collaboration with principle contractors Willmott Dixon, the Cherwell District Council and Oxford Brookes University amongst others have unveiled, what is considered a unique ‘eco-town’ in the area of North-West Bicester. One of the clearest ways in which this scheme differs from many others is that the houses themselves are fully ‘eco-friendly’ but also the scale and urban design of the whole area is eco-friendly too. It is the first ‘eco-town’ to completely fulfil the objectives in the strict planning policy PPS1 for the delivery of ‘eco-towns’. This new development sells itself as a sustainable lifestyle choice with amenities such as 40% green space, rainwater harvesting, triple glazing, photovoltaics on all homes, electric car charging points, and an electric car club as well as specially designed pedestrian and cycle paths to encourage minimal car journeys. Guide prices for those serious in taking an environmentally friendly approach to their living habits range from £335,000 for a 2 bed terraced house up to around £570,000 for a 5-bed detached house with help to buy schemes available on the whole range of housing, and appear to be competitively priced properties. The development also includes a new ‘eco-pub’, a retail centre and a primary school as well as a business centre providing extra local employment space. The property and infrastructures within the town have been designed carefully throughout their potential life cycle from construction to demolition to be sustainable. Construction measures taken when building these ‘True Zero Carbon’ (TZC) houses include a dramatic reduction in waste through careful procurement of materials, sustainable drainage systems (SUDS) and homes meeting national standard Level 5 in the code for sustainable homes. 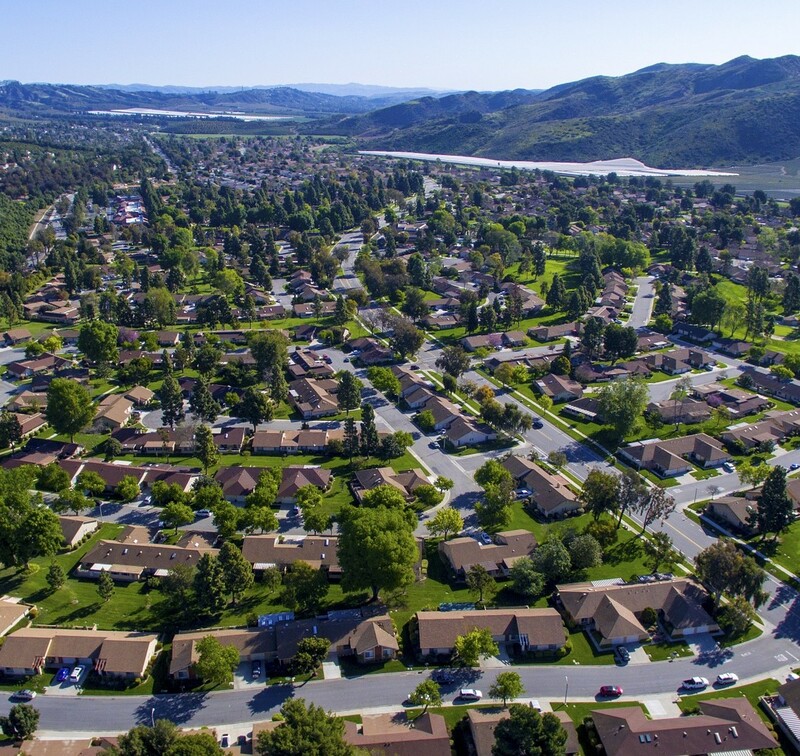 Many other ‘eco-towns’ are planned or currently being constructed, and this number is likely to grow as we justify meeting extra housing needs by building on ‘infill sites’. The Iron Bridge over the River Severn at Iron Bridge Gorge – is about to undergo a £3.6 million facelift. The industrial revolution was a pivotal part of shaping the UK and despite us being in a more ‘technological age’, the industrial past of the country has left its rich legacy. This is apparent in the redundant coal and metal ore mines, quarries, historic buildings (warehouses and mills amongst others) and industrial structures such as maritime docks. There has been a growing awareness of industrial areas and their regeneration since 1970’s when many of the industries housed in those buildings were either no longer needed or moved into cheaper accommodation nearer major roads (partly due to different thoughts in the planning system to help improve air quality in the centres of towns and cities) and the traditional historic industrial buildings started to become redundant. This enthusiasm for conservation and preservation of our industrial past is considerably apparent in Ironbridge Gorge in Shropshire and the bridge that traverses the gorge. The Georgian bridge has a wealth of historical and architectural significance and a recent crowdfunding appeal by English Heritage has raised most of the £3.6 million needed to fully restore the ‘Ironbridge’. 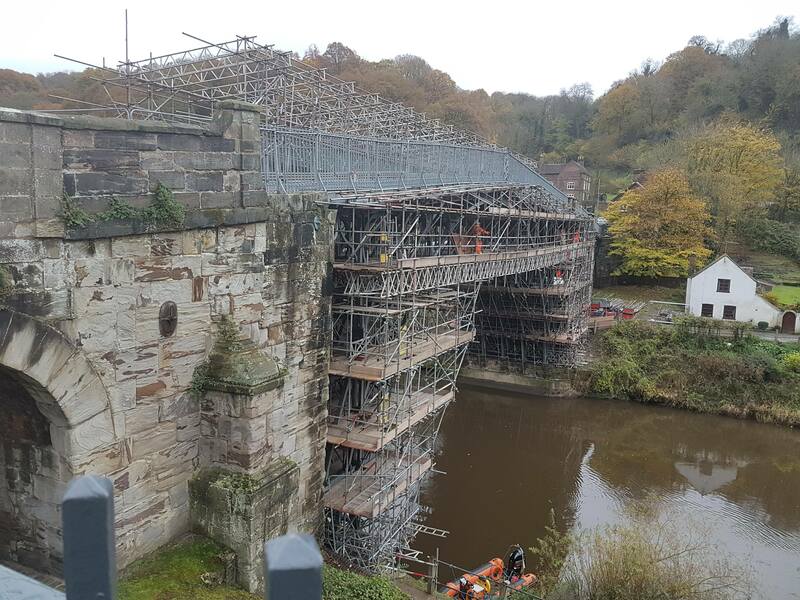 The beauty of the bridge is currently under the support of scaffolding and sheets of protection whilst the first stages of the work are started. The arches of the cast iron bridge that was cast nearby in 1778 and built in 1779, were pieced together to produce a single span bridge that is iconic of this area. The bridge was used until 1934 when it was closed and declared an ancient monument, giving it statutory protection. The decision to close the bridge was taken after stress cracks developed in the ironwork some of which dated from just after the bridge was built, after an earthquake at the end of the 19th Century and due to geological movement over the years. The aesthetics of the bridge are considerably pleasing and the bridge has a special place in the hearts of people in the area with £40,000 raised in just over a week from local crowdfunding appeals. An additional £889,680 has been given by the German foundation Hermann Reemtsma Foundation that helps to support heritage conservation projects in Europe, with English Heritage providing £1.25 million. The funding will go towards repairing the ironwork and painting the bridge in a paint specially formulated to match its original colour. A long awaited improvement scheme is given the go ahead – but not everyone is happy. Theories abound when it comes to Stonehenge and its provenance; it is the site of a huge feast of Scottish food, a former religious complex, it used to be in Wales! One thing that is very much in evidence is the location of Stonehenge next to the infamous A303 road from Basingstoke to Honiton via a ‘West Country corridor’. Winding through the beautiful landscapes of Hampshire, Wiltshire, Somerset and Devon, the A303 is notorious for its traffic congestion, especially in the summer months. The traffic on the A303 suffers from a particular bottleneck at the point where the road passes the stones at Stonehenge and often a couple of miles either way. Already there have been many years of proposed plans, protests and arguments and despite the government approving a route for the tunnel just south of the UNESCO site – the topic is no less contentious. Stonehenge is described in the UNESCO literature as ‘an incomparable testimony to prehistoric times’ and is thought to have 5,000 years of history. The whole area around Stonehenge which is a world heritage site, with many ancient monuments, needs protection. How to protect Stonehenge whilst ensuring the area can cope with the traffic demands and the long period of actually coming to a decision has been described by the AA’s Edmund King as ‘a monument to modern-age indecision’. The problem is the variety of stakeholders involved in trying to find a solution. The historians believe it will harm archaeological remains, the motorists want less congestion and the government want the most cost effective way of dealing with the traffic issues. UNESCO have agreed the tunnel in principle although they have also offered advice about how this is done. 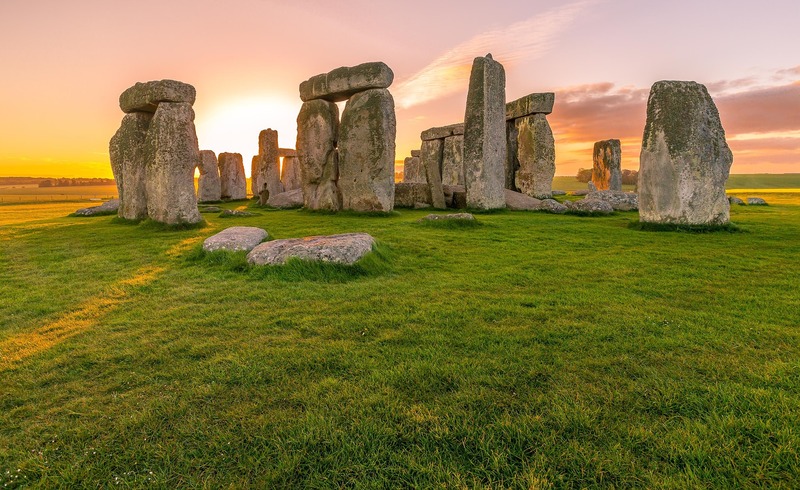 Some critics believe that parts of the UNESCO advice have been ignored, and this in an extreme case, could mean that Stonehenge would lose its UNESCO World Heritage Site status that offers the site heightened protection and increased tourism. Sadiq Khan’s pre-budget plea to Philip Hammond to introduce measures to help support London’s construction industry and the powers of local London councils to increase the provision of affordable housing, seems to have fallen on deaf ears. Khan has described Hammond’s 2017 budget measures as ‘anti-London’ with no funding for affordable housing or any commitment to an increase in powers of local London councils to build. This is an additional blow to the construction industry in London that is already dealing with the possible impacts of Brexit and the availability of skilled construction workers from the EU. Khan reported earlier this year that London needs to build 66,000 new homes per year to meet the increasing demands for housing in the city. With a rising demand, it is clearly imperative to be able to supply the housing as quickly as possible however, prior to Brexit, some construction companies are already reporting a lack of investment, skill shortages, and extended project times. Some members of the RICS are reporting problems sourcing skilled quantity surveyors and bricklayers amongst other specialist workers in the latest RICS Construction and Infrastructure Market Survey. The uncertainty of Brexit continues to unnerve the UK, but it is particularly pronounced in the construction industry in the capital who employ a significant number of workers from the EU. It is reported by g15, an organisation that emblematises 15 Housing associations in London, that in some skills EU nationals account for as much as a quarter of the workers. The government are being urged by Khan to come to an early agreement on the rights of EU national workers working in London to help their retention and to meet housing targets. The lack of investment or greater delegated powers for councils to increase housing supply in London is in sharp contrast to Hammond’s pledge to build 300,000 more homes nationally by 2020 and 100,000 more homes in Oxfordshire alone by 2031. Teams of researchers based at the Imperial College in London have joined important molecular science research with engineering, which could massively advance the possibilities of 3D printing and its future development. Dr Billy Wu, from the Dyson School of Design Engineering, a member of the research team, believes that to create more complex 3D objects with the current lack of specific tools has opened the path to advances in what is known as Additive Manufacturing (AM). 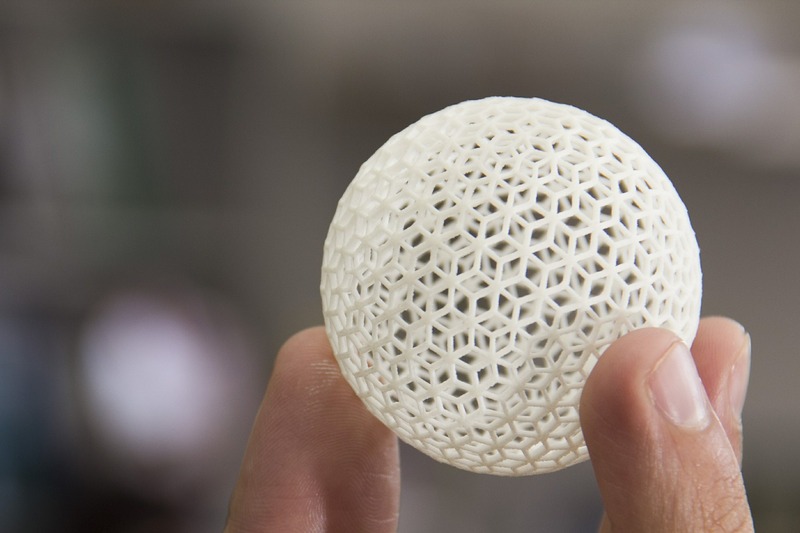 3D printing has proved itself important within many sectors of engineering, and is now considered a fundamental part of manufacturing techniques, especially within the medical, aerospace and motorsport sectors. The rapid growth of this technology has proved itself profitable, with profits from the use of stereolithic processes estimated to be in excess of $6 billion across the globe during 2016, and some believe that figure will reach a predictive global figure of $26 billion by 2022. The AM/3D technology is however limited at this current time, and many industries do not have the facilities or even the funding to introduce new machinery into their businesses. In addition to this, the development of improved design software needs to be addressed as well as the shortage of highly skilled training staff and reliable quality assurance practices. It is understood, that by using advances in molecular science in conjunction with engineering processes, will resolve some of the future complications that could arise as well as allowing for effective communication within the research of industrial applications across engineering and scientific disciplines. 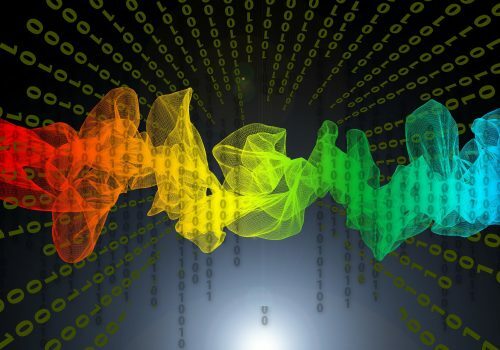 Communications Manager at Imperial’s Institute for Molecular Science and Engineering, Dr Shoshana Weider was reported to have said that by amalgamating researchers and stakeholders, it will deliver fresh foundations for an exciting revolution. Parts of the continuing research at Imperial College contain the advanced designs of “Multifunctional AM/3D lattice structures”. These structures can be utilised within larger civil engineering plans. By fabricating materials with multi-functional features, it will allow engineering firms to combine materials within one main structure – for instance, paving the way for electronic or communication cables to share available space. Improvements are also being investigated with metals, and how they are used during the processes of 3D printing. Researchers are exploring ways of enhancing printed components, and improving their understanding of structural density at the molecular scale. A team of researchers are also attempting to determine how costs could be reduced when printing 3D metal components. Currently, the process of Direct Metal Laser Sintering is used; however, this technique is proving expensive and inconsistent when producing parts on a large scale. Parts are often manufactured, but in large production runs, significant imperfections have been reported. Research includes the development of a lower-cost Electrochemical AM method of printing. This process would not involve the use of laser technology, but can still manufacture high quality parts. At the extreme end of the scale, a new 3D printing platform, using living matter has been introduced by a group of researchers, at the Laboratory for Complex Materials at the Swiss Federal Institute of Technology in Zurich. The research has been led by Andre Studart, with a newly developed ink containing bacteria that has made it possible to produce 3D prints of miniature biochemical plants, which contain various species of bacteria that scientists can use in the ink. Members of Studart’s research group including Patrick Ruhs and Manuel Schaffner who have used bacterial cultures from Pseudomonas Putida and Acetobacter Xylinum during their efforts. Pseydonmonas Putida breaks down the toxic chemical Phenol, while Acetobacter Xylinum secretes high-purity nanocellulose, a bacterial cellulose which can be used in pain relief applications. It retains moisture and remains stable, with the potential to be of future use in the treatment of burns. The researchers have produced a new printing platform that can offer many possible amalgamations. Scientists will be able to use up to four different inks that contain a range of different species of bacteria – these bacteria can have different concentrations, with a view to producing matters that exhibit numerous properties. By using a bio-compatible hydrogel to provide a viable structure, the hydrogel ink is made of Hyaluronic Acid, long-chained sugar molecules and Pyrogenic Silica. The cultures within the bacteria are combined within the ink, ensuring that the bacteria contain the prerequisites for life. The researchers are able to add specific bacterial strains with the required range of properties. By using the hydrogel as a base, they are then able to continue to print the three-dimensional structure of their choice. It is important that the development of the ink has the correct consistency, if the gel like ink is too thick, the mobility of the bacteria is compromised, whereas if the ink contains too much fluid, it would then affect the sturdiness of the structure, with the possibility of collapse. Schaffner described the successful formula as,“viscous as toothpaste, with the consistency of Nivea hand cream”. Scientists and researchers are yet to study the resulting biological constructs’ life expectancies, and for now have assumed that they should last a long time due to bacteria requiring little resource. The research is still in its infancy, yet its potential is huge due to the range of bacteria available. Bacteria tend to have a bad reputation, due to the amount of bad bacteria that can cause diseases and illness. The body however can’t survive without bacteria, and most are harmless and in fact beneficial to our bodies. Researchers envision many other uses in addition to these medical and biotechnological investigations. It could potentially be used to examine degradation processes, or the creation of biofilms. A 3D sensor contacting bacteria could be used to detect toxins in drinking water, and nano filtration constructs could also be created to use in the event of catastrophic oil spills. Unfortunately, there are many challenges to be overcome, such as the speed of the printing time and scale. It can take many days for Acetobacter to produce cellulose for biomedical use. Even so, scientists believe that this process can be accelerated. Studart’s specialist team will continue with their research in this field. An 8-legged robot, Octobot is the first of its kind. Powered by chemical reactions instead of mechanical actuators with a running time of up to 8 minutes, this independent, soft robot can solely run on power that is created within its own body, without the use of any external power source. With pneumatic limbs, driven by oxygen that is formed from Hydrogen Peroxide that reacts with Platinum catalysts, the Octobot is made using a combination of soft materials, and able to operate independently for a duration of 4-8 minutes. This emerging sub-field of soft robotics has created one of the most intriguing robots to date. With an entirely soft exterior, no external components and without any internal hard components, Octobot is the first real specimen of the once thought of vision of the future for robotics. Robert Wood, from Harvard University worked on the research behind the Octobot. During a recent interview for an article in Nature, he explained how the arms were ‘driven’ with internal pressure, that stretches the walls of internal actuators. The pressure inside the Octobot is produced by the internal chemical reaction, which in turn sources its movements in the arms, with the inflation of internal compartments within the robot. It is believed that the production of this small soft robot is just the beginning, and that the creation of larger scaled soft robots will be witnessed, although larger robots would no doubt need some form of internal support. Over the next 30 years, it is estimated that passengers using the UK’s railway network will double following a range of improvements announced by the government. Proposals that include the potential to re-open railways lines that have been closed since the 1960’s and 1970’s have been announced, such as the introduction of new technologies with a view to reducing overcrowding and delays. 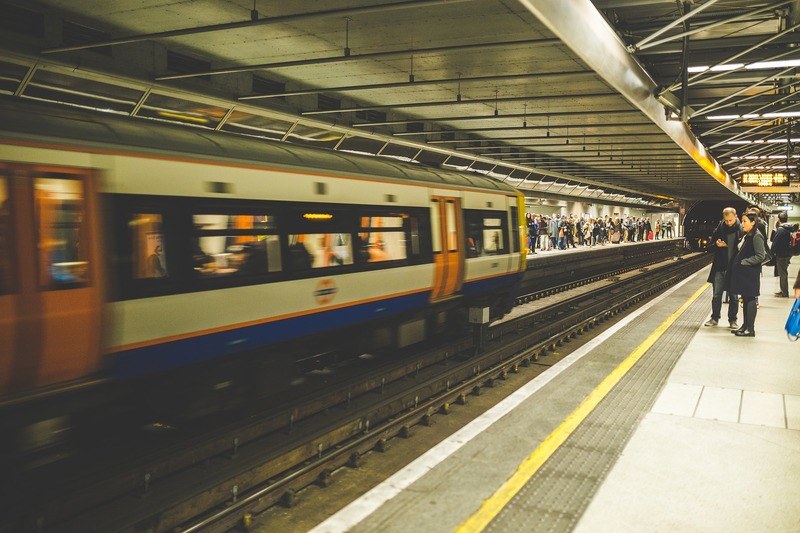 Chris Grayling, the Transport Secretary announced the planned end of the operations that divide track and train, by introducing smaller train operating franchises, whilst improving compensation schemes for passengers. The Industrial Strategy was released earlier this week. The reopening of the Oxford-Cambridge railway line – the so-called Varsity Line – already has existing plans. Other connections and lines could also be resurrected to transport passengers. The government however has yet to identify these. By re-opening some of the former lines originally mothballed by the infamous Beeching Report of the 1950s, the plan is to anticipate the increasing number of passengers using public transport. It will also been seen to help inspire local communities and their economic growth, while reducing harmful emissions. A white, middle-aged man in a high-vis jacket, a beard, that wears glasses and has short brown hair is the typical appearance of an engineer, according to an Institution of Engineering and Technology’s (IET) study involving 1000 school children, between the ages of 9-16 years of age. The out of date notions of school children and parents concerning engineering could be detrimental to the industry, especially as there is a significant shortage of engineers within the UK. Should this continue, it is believed that it could pose a serious threat to the UK’s economy. During the study, it was noted that fewer than 1 in 10 children connected or described women in the engineering field. 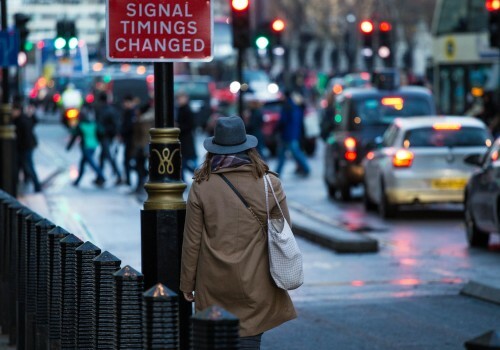 The IET want to see changes to dissipate these deep-routed notions regarding engineering, by embarking on a new campaign marking the 40th Young Woman Engineer of the Year awards. The campaign will be used to highlight the diversity of engineering and the career opportunities available to females. Wide-ranging reasons have been cited for this lack of women, from gender stereotyping and limited female role models, to misconceptions about the job itself and parental attitudes. It is believed that a Russian launch from the Vostochny Cosmodrome, designed in part to launch 18 micro satellites into Low Earth Orbit, has in fact ended up at the bottom of the Atlantic Ocean as a result of a malfunction following it’s launch. The launch told place last week and seemed at first to be successful, until communication with the satellite’s hardware ceased. The Meteor M2-1 satellite was due to go into Low Earth Orbit; however, approximately 9 minutes into the mission, the launch was in trouble. According to reports, the separation of the Fregat stage had not been successful, meaning that none of the satellites onboard were able to reach the necessary altitude, forcing the payload module to fall back to Earth. It is believed that the payload would have been destroyed by friction in the air on its descent back to Earth with its debris falling into the ocean. 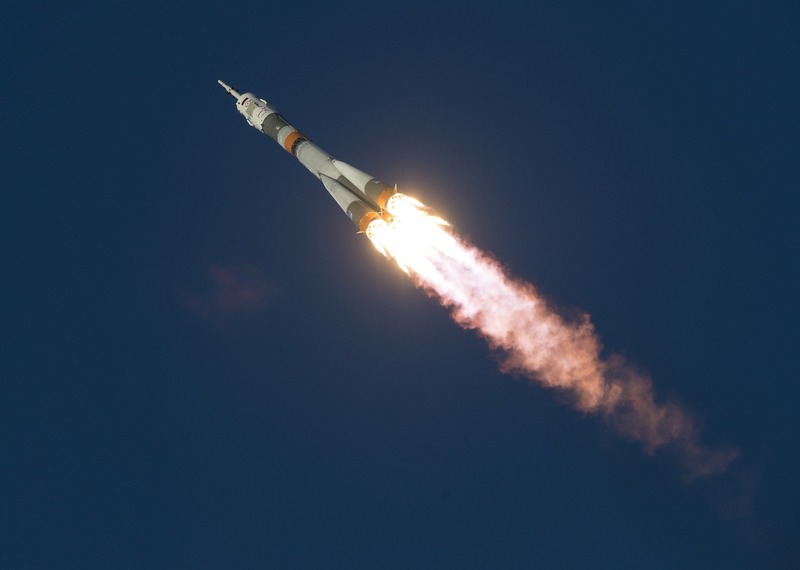 It was only the second launch from Russia’s newest cosmodrome. 10 Satellites from the San Francisco based Spire Global were also onboard the failed launch. Spire Global have not been able to communicate with any hardware from the satellites, and would have received some for of communication from the satellites had the launch been successful. 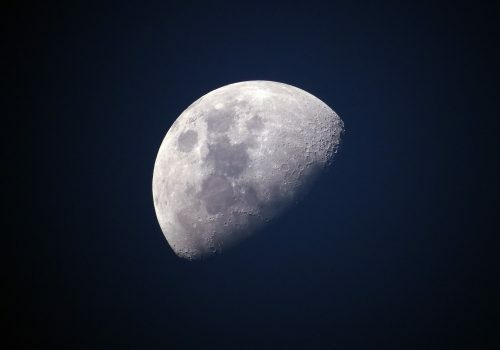 The US based company are still awaiting confirmation from the Russian Space Agency to confirm the outcome. According to reports, it has been claimed that ‘misconfigured’ software caused the malfunction. The software was programmed for the launch to take place at another base in Russia, namely the Baikonur or Plesetsk cosmodromes. The satellite’s software was not set up for a launch at Vostochny. Because of this, the flight control system contained incorrect settings, and as a result got itself confused during the first pre-programmed main engine fire. The rocket was changing altitude during this manoeuvre, which forced the rocket into the wrong trajectory.